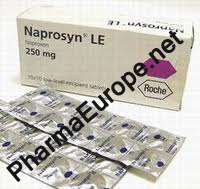 Naproxen belongs to a group of medicines called non-steroidal anti-inflammatory drugs (NSAIDs). It works by blocking the action of a substance in the body called cyclo-oxygenase. Cyclo-oxygenase is an enzyme that is involved in the production of various chemicals in the body, some of which are known as prostaglandins. Prostaglandins are produced in response to injury or certain diseases and cause pain, swelling and inflammation. As naproxen stops the production of prostaglandins, it is effective at relieving pain and inflammation. All the medicines in this group reduce inflammation caused by the body's own immune system and are effective pain killers.